Cowper acquired (exactly how is a source of historical controversy) the printing plates for Anatomy from Dutch anatomist Govard Bidloo, whose own tract didn’t sell nearly as well. 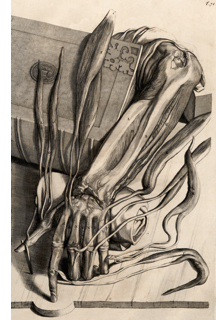 This engraving shows the muscles of the lower arm and hand spread across a book and dissection table. “It’s almost as if it’s alive,” says Schwartz.